This is the second in a series of short posts about the talks given at the Special Symposium on Advances in Modeling and Analysis Using Python, held at the 91st AMS Annual Meeting, on January 27, 2011, in Seattle, WA. The full program of the Symposium, with links to abstracts and presentation screencasts are available online. 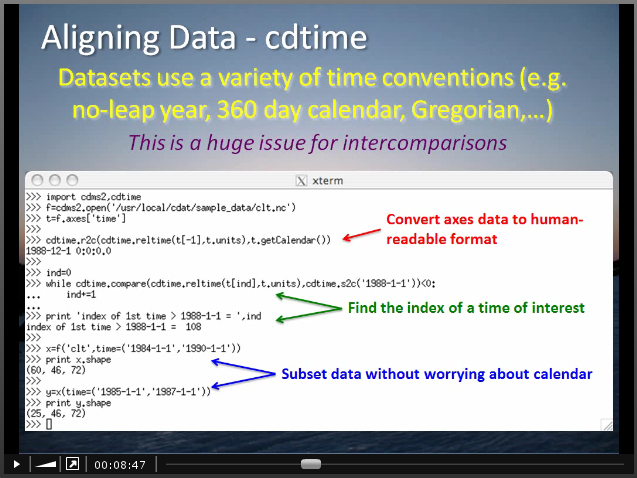 Peter Caldwell gave a talk on using the Climate Data Analysis Tools (CDAT) for conducting model intercomparisons. As the word “tools” in the package name suggests, CDAT is a suite of tools, rather than a monolithic application. Of these tools, the Climate Data Management System (cdms2) package is probably the one that is the most familiar to newer users, but as Caldwell outlines, CDAT contains tools that enable you to simplify/automate a variety of tasks related to intercomparisons, including: downloading/accessing data, concatenating files into virtual files, incorporating metadata, aligning data from datasets that use different time conventions, regridding, etc. Caldwell includes Python code snippets illustrating each of his examples; if you’re interested in the code, the Powerpoint slides of his talk are also available online. This entry was posted in Advanced, Data Analysis, Featured Tips, Gridding, I/O, Time Series Analysis. Bookmark the permalink.